I thought it might be fun to look at the effects of adding or subtracting tips at random from the tree. We already know that random missing taxa tends to create trees with longer than expected terminal edges - seemingly a slow-down in the rate of lineage diversification through time. 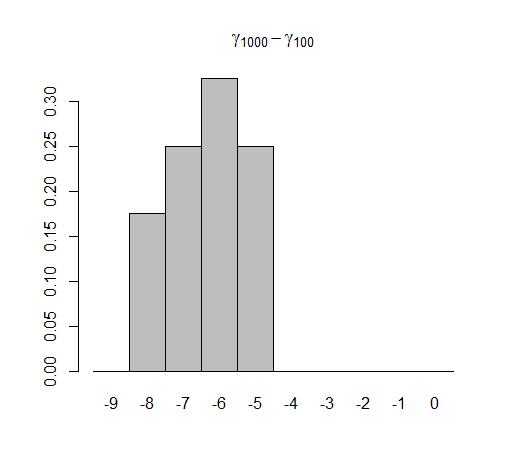 Adding taxa at random, at least by our algorithm, does not seem to affect tree shape all that much; but subtracting random tips, as we expected, makes γ turn progressively more and more negative. So, on the face of it, it seems as though adding taxa randomly (from 100 to 1000 species in the tree) or dropping taxa (from 1000 to 100) both result in a decrease in γ - however the scale of decrease is highly asymmetrical, with random subtraction resulting in a much greater decrease in γ. At the start of this little experiment I wasn't sure if random addition of taxa would increase or decrease γ, and in the end it seems to decrease γ but sometimes only a little. If I remember Nee et al. 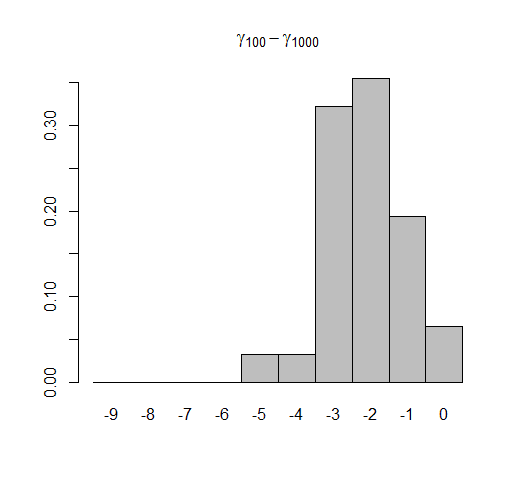 rightly, the probability of an additional random tip should be the same as the probability of having a branching time of time t, as that's just the probability of having a lineage which survived for duration t.
I think if you weighted tip addition in this way, relative to values of the birth and death rates, it would produce trees with no distortion of the estimated gamma parameter. Actually, looking at your code, perhaps I misinterpreted your previous post about random new tips and cumsum. Now it looks like you're using it to pick an edge at random, with longer edges weighted to have a higher chance of getting chosen relative to their length? That's basically letting edges to go anywhere with uniform probability across the tree, something which would be unexpected under Yule/birth-death.